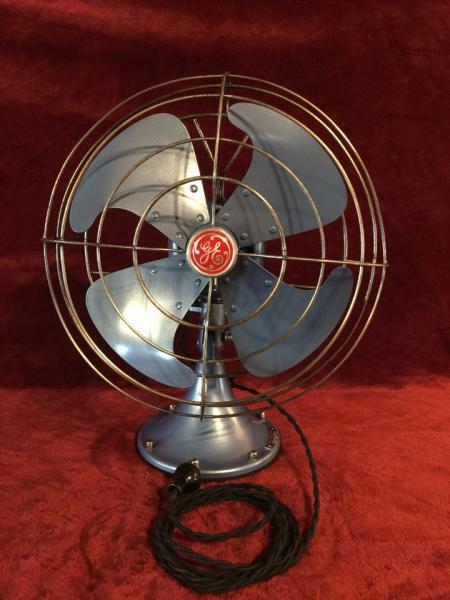 AFCA Forums > Antique Fan Collectors Association > Pre-1950 (Antique) > GE FM12V1 - good buy or not? There’s a General Electric Vortalex in an antique mall near me, model no. FM12V1. No pictures, sorry - I didn’t have means of taking any. It’s finished in a sort of ice blue all over except the cage; if it’s not factory paint, it’s a well done refinish from years back since the fan has decades of grime all over it. It’ll need a good cleaning, but it looks good otherwise - no rust or missing paint. The aluminum-colored cage has a few freckles of discoloration, but otherwise looks good and is not bent in unintended ways. The four blades look good. There’s a brass oiler underneath in front. No carrying handle. The fan had been rewired, and now only works on one of the speed settings. That didn’t concern me overly much, as I think I can rewire it properly I plugged it in to test it, and it was smooth and quiet. Just a tiny bit of wobble at each end of the oscillation - I was impressed by how smooth it was otherwise. However, the switch feels spongy even though it’s set securely in the base; the detents weren’t crisp and definitive, but rather were vague suggestions of where to stop the cream-colored knob. Also, I could only detect two speed settings - is the FM12V1 really a two speed fan, or is it supposed to be three speeds? 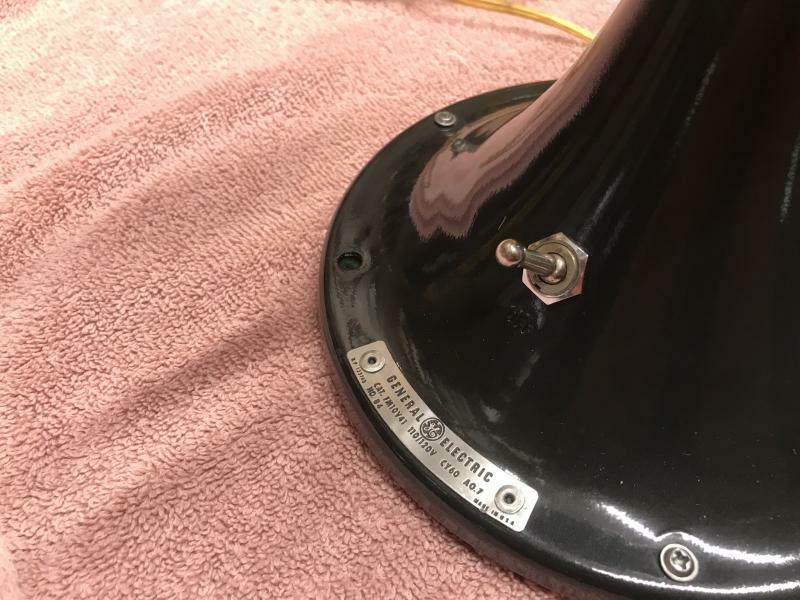 Also, I couldn’t see how the bottom plate was attached to the base; on the other fans I’ve worked on, there were two or three screws either from below through the plate or from above through the base. All I could see were three tiny rivets in the base (besides the ones for the data plate). Was that how the plate was attached, and if so, how is it removed? There’s a layer of felt, but I couldn’t see any screws hiding in that. I can get it for $82 out the door. Worth it, or should I walk away with celerity? How much of a premium, if any, does the ice blue color command on this particular fan? Is the switch’s sponginess normal, or can it easily be repaired? Anything else I should watch out for? Thanks in advance! I'd buy it if it were local to me. Richard Daugird wrote: I'd buy it if it were local to me. What about this fan would influence your decision? I haven’t seen much online in the way of commentary regarding its value - just tech tidbits, really. So I’m curious. I have maybe a dozen Vortalex fans. 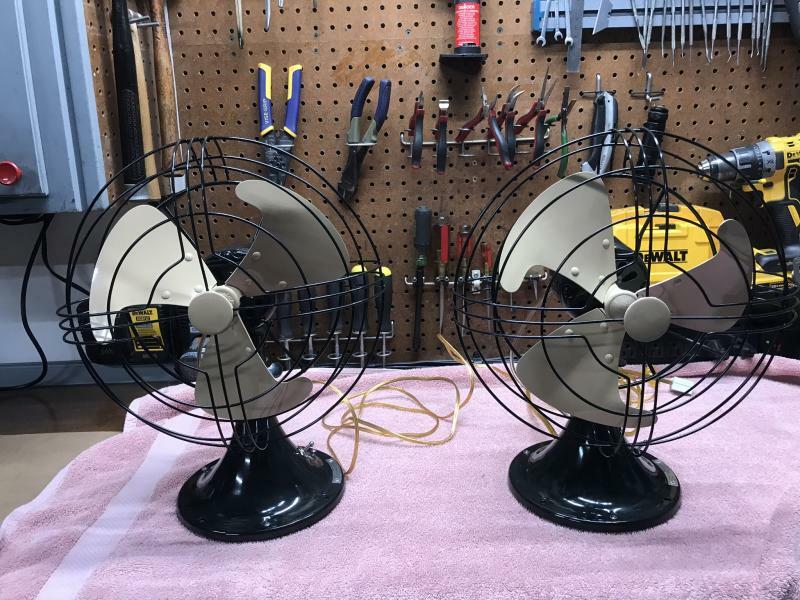 They are my favorite fans besides the cast iron and brass fans. I’ve spent as much as the selling price before just on shipping. 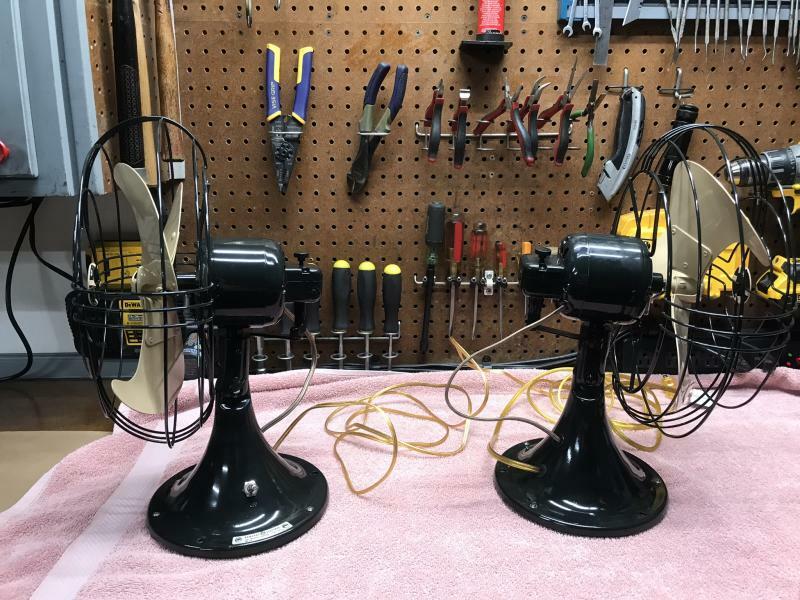 I don't think the Vortalex fan is particularly valuable, and as such, doesn't generate the level of interest as many of the older, brass blade/brass cage fans. 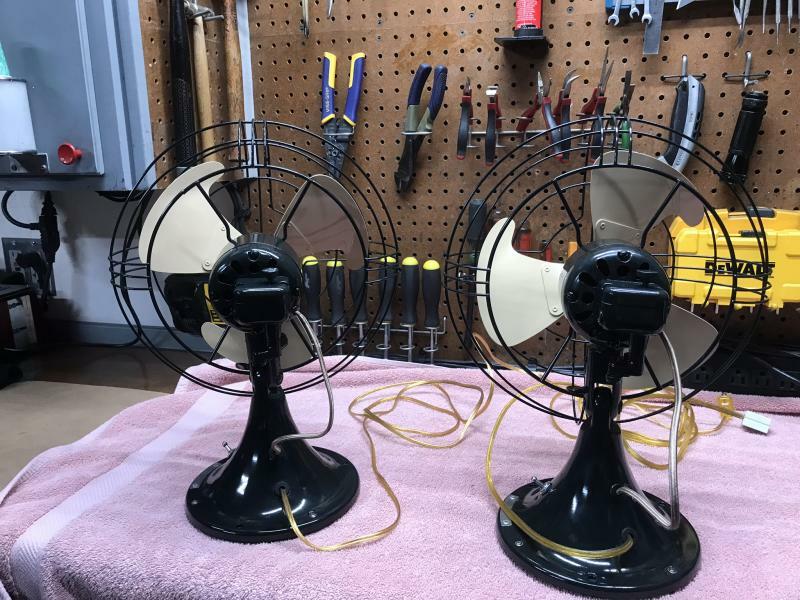 But, the Vortalex is a very cool fan, and I have a 12" and a 9" in my den. Both are quiet and smooth running. I bought this wrecked 12" for $50 with a broken cage and broken neck. I had to hold the motor head just to take the picture. It was a fun to bring it back to life. I'd buy the fan and dive in. Bought these two 10V’s a couple of years ago. Definitely needed a little TLC. Decided to do something to add a little pizazz to them so went with Charleston green and tan blades. New wiring and a full tuneup and they are ready to go. haven’t decided to keep them or not. The color I described is the one on Allan’s fan, and on the two in the center and right of center in Steve’s pic. Does it have an official name? Thanks for the input thus far, folks! The one you are looking at must have been repainted, FM12V1 should be bronze in color, per information posted above. I have one, as well as an FM10V1, both bronze. Richard Daugird wrote: The one you are looking at must have been repainted, FM12V1 should be bronze in color, per information posted above. I have one, as well as an FM10V1, both bronze. Yes, after reviewing that information, I suspect I must have read the data plate wrong. The paint really did look factory issue, so I bet the fan is actually a later version of the 12” model finished in that bluish color. I’ll need to take pics the next time I’m at the store, if they still have it. I would just go ahead and buy it. And then take pictures when you get home and show us. For $82, I'd hold off. The later blue Vortalex fans are quite common and not too valuable. The brown/tan models and black/aluminum models are nicer looking in my opinion and are worth more. All run nicely if well balanced and maintained. 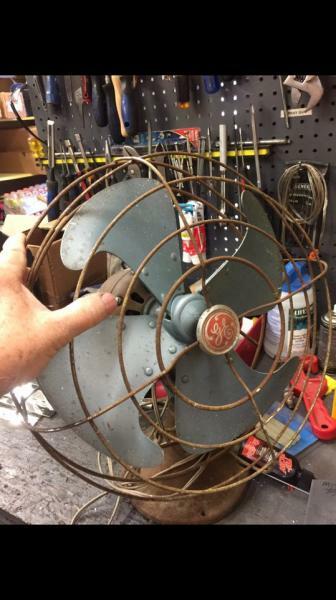 That blue color that GE Used on the Vortalexes from 1950 until 1958 was what's referred to as Blue Spruce, and then from 1959 until 1963 (which was the last year for the Vortalex) the fans were a cream color (don't remember the name that GE Called that color right off the bat). Page processed in 0.2194 seconds (33% database + 67% PHP). 30 queries executed.